Why should I use phpBB ? 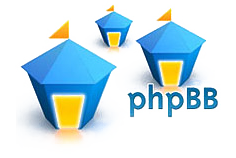 phpBB is short for “PHP Bulletin Board”; it is a software package that enables you to create a whole community site or to implement a forum in your existing one. phpBB offers lots of features: topic and user ranks, signatures, user and group permissions, user groups and avatars, numerous options for moderators, so they can be in full control of topics, editing process etc. you can easily enable attachments in the forum, quotes, polls and drafts. There is also an integrated search option, private messaging, email notifications and ATOM feeds, you can use various databases, add CAPTCHA, block users or limit the number of posts. The look of phpBB is also customizable and visitors can select their own style. Its features can be even further extended with plug-ins. phpBB is with open source and it’s free. This software surprises with the customizations and add-on capabilities. You can easily customize the theme of your forum as you want. If you are familiar with HTML, CSS and PHP you can implement many customiziations and add more flare to your website, even without the mentioned skills you can create very good forum for your brand. If you want to build a customized and effective forum phpBB is perfect tor you.